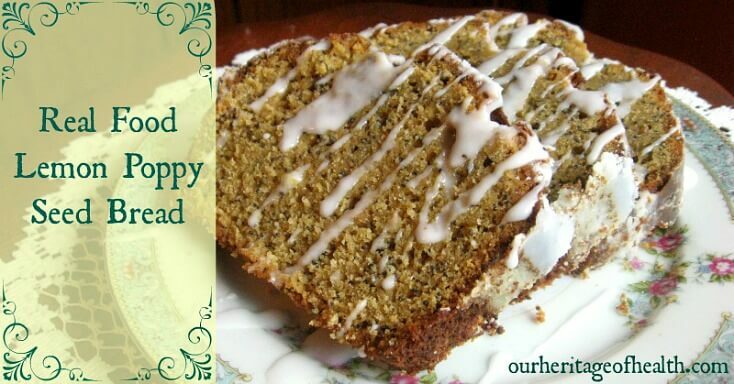 Along with pumpkin bread and zucchini bread, lemon poppy seed bread is one of my favorite sweet bread recipes. I think it’s a perfect recipe for spring, too, because the lemon flavor is so bright and fresh. And for those of us living in places where there is still snow on the ground, a little bit of spring sounds pretty good right now! 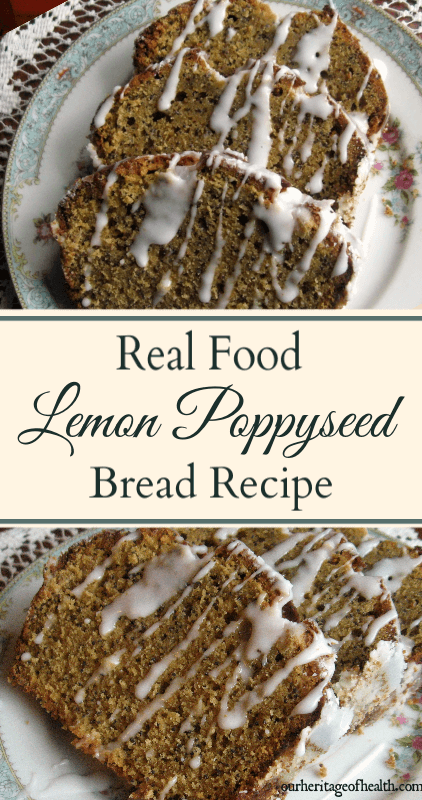 I took my favorite lemon poppy seed bread recipe and modified it to use real food ingredients like pastured eggs, grass-fed butter, whole cane sugar, and organic heirloom flour. When possible, organic and pastured-raised ingredients are always the best option, but just do whatever you can! Even if you can’t afford all organic, a homemade bread is still a better option than the fake preservatives and additives in store bought breads. * If you use all einkorn flour, you may not need much water at all, but if you use a sprouted whole grain flour or an all-purpose flour, the water will help thin out the batter to the right consistency. In a large mixing bowl, combine flour, sugar, baking powder, salt, and poppy seeds. In a separate bowl, stir together melted butter, vanilla, lemon extract, and lemon juice. Beat eggs lightly and add to the butter mix. Gradually add in flour, mixing well to combine, and adding in a splash or two or water if necessary to reach a batter-like consistency. Spoon batter into a greased 9×5 inch bread pan and bake at 350 degrees for 50-60 minutes, or until a toothpick inserted in the center comes out clean. (Optional): Drizzle bread with a little bit of lemon-flavored icing to make it look pretty.